Seven (seven!) processes are immediately spawned by the shell. The first filtering process, grep, starts with a read(2) call on its stdin pipe. When the process first spawns, the pipe is empty - so the entire process blocks until it can read more data. Again, we see implicit execution control based on the availability of data. As soon as the preceding command in the pipeline fills or flushes its buffer, grep‘s read(2) call returns and it can filter the lines that it’s read in from the preceding process. Every line that matches the provided pattern is immediately printed to grep’s stdout, which will be available to the next program in the pipeline. awk functions exactly like grep does, only on different buffers. When data is available, awk resumes execution and processes the data, incrementally writing its results to its stdout. When data is not available, awk is blocked and unable to run. sort operates slightly differently than the preceding two processes. As a sorting operation must take place on the entirity of the data, sort maintains a buffer (on disk) of the entire input received thus far. (There’s no point in providing a sorted list of all the data received so far, only to have it invalidated by a later piece of data.) As soon as sort’s stdin closes, sort can print its output to its stdout, as it knows no more data will be read. tail is somewhat similar to sort in that it cannot produce any data on stdout until the entirity of the data has been received. This invocation doesn’t need to maintain a large internal buffer, as it only cares about the last line of the input. cut operates as an incremental filter, just like grep and ack do. Using a pipeline for this task should seem like a no-brainer. Every task being done here deals with filtering data. Existing data sets are changed at each step. Every process does its own job, and does it quite well, as the Unix philosophy recommends. Each process could be swapped out for another with very little effort. One other advantage of pipelines is their inherently good performance. Let’s use a modified version of the command we ran above to find the memory and CPU usage of each filter component in the pipeline. After running this command and checking the maximum resident set size, as well as the number of voluntary and involuntary context switches, we can start to see a couple very important things. The maximum amount of memory used by any one filter was 2,830,336 bytes, by cowsay, due to the fact that it’s implemented in Perl. (Just spawning a Perl interpreter on my machine uses 1,126,400 bytes!) The minimum was 389,120 bytes, used by tail. 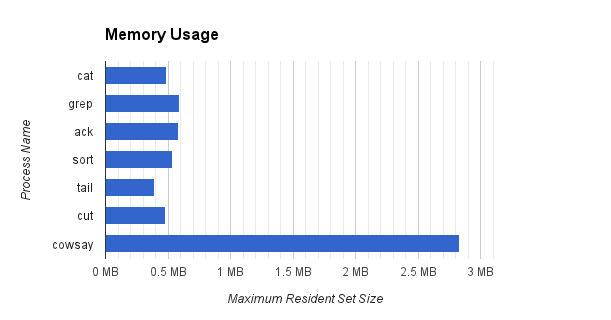 Even though our original source file (/usr/share/dict/words) was 2.4 MB in size, most of the filters in the pipeline don’t even use one fifth of that amount of memory! Thanks to the fact that the pipeline only stores what it can process in memory, this solution is very memory-efficient and lightweight. Processing a file of any size would not have changed the memory usage of this solution - the pipeline runs in effectively constant space. Notice that the first two processes, cat and grep, have a large number of voluntary context switches. This is a fancy way of saying blocking on IO. cat must voluntarily context switch into the operating system when reading the original file from disk, then again when writing to its stdout pipe. grep must voluntarily context switch when reading from its stdin pipe and writing to its stdout. The reason that ack, sort, tail and cut don’t have as many context switches is that they deal with less data — grep has already filtered the data for them, resulting in only twelve lines that match the provided pattern. These twelve lines can fit easily within one pipe buffer. cowsay seems to have an unusually high number of involuntary context switches, which are probably caused by the process’s time quantum expiring. I’m going to attribute that to the fact that it’s written in Perl, and that it takes ~30 milliseconds of CPU time to run, compared to the immeasurably small time that the other programs take to run. Note that although this example pipeline is amazingly simple, if any of these processes were doing complex computations, they could be automatically parallelized on multiple processors. Aren’t pipelines awesome? Yes indeed - pipelines are awesome. They make efficient use of memory and CPU time, have automatic and implicit execution scheduling based on data availability, and they’re super easy to create. Why would you not want to use pipelines whenever possible? The answer: error handling. If something goes wrong in one of the parts of the pipeline, the entire pipeline fails completely. Let’s try out this pipeline, with an added command that I’ve written in Python. fail.py echoes its standard input to standard output, but has a 50% chance of crashing before reading a line. So, what happens in this case? When fail.py fails while reading the input, its stdin and stdout pipes close. This essentially cuts the pipeline in half. Let’s take a look at what each process does as you get further and further away from the failed process. tail, the process immediately after python, also receives a SIGPIPE signal as soon as its stdin pipe closes. It can choose to handle the SIGPIPE with a handler, or to ignore the signal, but either way - its next call to read(2) will return an error code. This event is indistinguishable from the end-of-stream event that tail receives anyways when the input stream is done. Hence, tail will interpret this as a normal end-of-stream event, and will behave as expected. cut will also behave as expected when the stream closes. cowsay will behave as expected when the stream closes, printing out the last word in the sorted list that was received before the python process crashed. Notice that Tux is no longer saying unimpurpled, the word that he was saying before. The word is wrong! The output of our command pipeline is incorrect. Although one of the filters crashed, we still got a response back - and all of the steps in the pipeline after the crashed filter still executed as expected. This array stores the return codes of every process in the previous pipe chain - and only here we can see that one of the filters crashed. 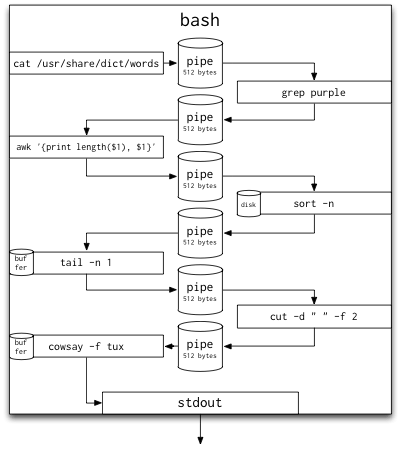 How are pipes useful in the real world? How could pipes help me in my web app? Valid questions. Pipes work great when your data can be divided into very small chunks and when processing can be done incrementally. Here’s a couple examples. This command is a little more complicated than the simple pipeline we used above. First, we’re using a built in bash construct - the while loop with a read command inside. This reads every line of the input (which we’re piping in from ls) and executes the inner code once per line. Then, the inner loop invokes flac to decode the song, and lame to encode the song to an MP3. How memory-efficient is this pipeline? After running it on a folder full of 115MB of FLAC files, only 1.3MB of memory was used. Finally, the last process can bake any lines that remain into PDF files. And there you have it - an asynchronous, extremely-memory-efficient pipeline that can process huge amounts of data, with a very, very small amount of code. UNIX pipes are great, but they do have their drawbacks. Not all software can fit directly into the UNIX pipe paradigm, and UNIX pipes don’t scale well to the kind of throughput seen in modern web traffic. However, there are alternatives. Modern “work queue” software packages have sprung up in recent years, allowing for rudimentary FIFO queues that work across machines. Packages like beanstalkd and celery allow for the creation of arbitrary work queues between processes. These can easily simulate the behaviour of traditional UNIX pipes, and have the major advantage of being distributed across many machines. However, they’re fairly well suited to asynchronous task processing, and their queues typically don’t block processes that try to send messages, which doesn’t allow for the kind of implicit execution control we saw earlier with UNIX pipes. These services act more as messaging systems and work queues rather than as coroutines. pressure is still in alpha, and definitely not ready for wide-scale production deployment, but you should definitely try it out! Pipelines are hugely useful tools in software that can help cut down on resource usage. Bounded pipelines act as coroutines to only do computation when necessary, and can be crucial in certain applications, like real-time audio processing. pressure provides a way to easily use pipelines reliably on multiple machines. Try using the pipes-and-filters paradigm to solve your own software architecture problems, and see how simple and efficient it can be!